Following a report that Apple is considering a major overhaul of iTunes, an overlooked rumor from March suggests the company may also be planning an entry into the high-definition music industry with 24-bit tracks. Citing an unnamed source, blogger Robert Hutton claims Apple will launch hi-res audio sales "in two months" to coincide with the release of three Led Zeppelin remasters. According to Hutton, Apple will be charging an addition dollar for high-resolution tracks, suggesting the new feature will be offered inline with the usual iTunes track and album purchase options. Apple currently requires publishers provide 24-bit ALAC tracks with high sampling rates to increase sound quality when transcoded to the lossy AAC format currently available on iTunes. Like the MP3 codec, AAC cuts a good portion of data from the original mastered version, trading subtle nuances in dynamic range, fidelity, detail and other sound quality metrics for smaller file sizes. Backing up the rumor is Apple's "Mastered for iTunes" initiative, which provides studios with specialized software —specifically AU Lab —to check how AAC conversion affects the uncompressed masters. Studios then pass the original 24-bit masters (at varying sampling rates) to iTunes, which creates lossless files and encodes them into 16-bit AAC tracks. 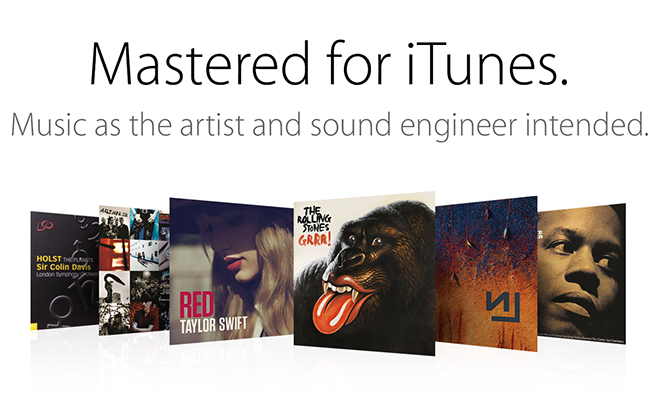 This means Apple has a huge repository of lossless music. Being light on details, however, the blog post, spotted by MacRumors, is somewhat suspicious and Hutton mainly uses known Apple operating procedures to back up his claims. Still, the idea is not out of the realm of possibility given rumblings of a "dramatic" iTunes music store overhaul.